Make small individual balls of the dough. Mix paneer, dhaniya, green chili, salt, cumin and red chili powder together in a bowl. Flatten the balls and fill in the paneer mixture. 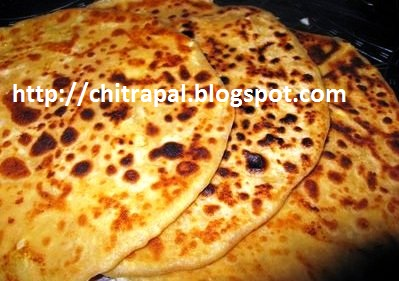 If parantha’s become little sticky dust dry flour while flattening. Heat the non stick flat pan with 1 tsp of oil each time you cook new parantha. Cook them one by one on both sides. Serve with mango pickle or chilled cucumber raita. This is how it is made normally in the North. My mother in law used to make a dip in the dough and add a dash of oil before putting the filling. Give this a try sometime. Thanks for a nice recipe. nice recipe. but i also added some finely chopped onions and garlic and it came out to b very tasty!!! My mom will be impressed if I cook this. Good Chitra, Rabz and Christy your recipes are great. Keeps us going and cook instead of buying ready made stuff.